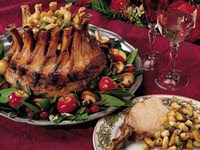 An easy yet impressive main dish, crown roast of pork is served with a savory mushroom stuffing. Heat oven to 325 degrees F. Sprinkle pork with salt and pepper. On rack in shallow roasting pan, place pork with bone ends up. Wrap bone ends in foil to prevent excessive browning. Insert ovenproof meat thermometer so tip is in thickest part of pork and does not touch bone or rest in fat. Place small heatproof bowl or crumpled foil in crown to hold shape of roast evenly. Do not add water. Roast uncovered 2 hours 40 minutes to 3 hours 20 minutes. Meanwhile, make Mushroom Stuffing. About 1 hour before pork is done, remove bowl and fill center of crown with stuffing. Cover stuffing with foil for first 30 minutes. Remove pork from oven when thermometer reads 150 degrees F; cover with tent of foil and let stand 15 to 20 minutes or until thermometer reads 160 degrees F. (Temperature will continue to rise about 10 degrees F, and pork will be easier to carve.) Remove foil wrapping from bone ends. To serve, spoon stuffing into bowl and cut pork between ribs. 1. In 4-quart Dutch oven, melt butter over medium heat. Cook celery, onion and mushrooms in butter about 3 minutes, stirring occasionally, until tender. 2. Stir in half of the croutons. Cook, stirring frequently, until evenly mixed and croutons are softened. Stir in remaining croutons and ingredients. Stuff turkey just before roasting. Or spoon stuffing into ungreased 3-quart casserole or 13x9-inch glass baking dish; cover and bake at 325 degrees F for 30 minutes, then uncover and bake 15 minutes longer. Calories 360 (Calories from Fat 180); Total Fat 20g (Saturated Fat 8g, Trans Fat 1/2g); Cholesterol 110mg; Sodium 660mg; Total Carbohydrate 13g (Dietary Fiber 1g, Sugars 2g); Protein 34g. Daily Values: Vitamin A 6%; Vitamin C 0%; Calcium 2%; Iron 10%. Exchanges: 1 Starch; 0 Other Carbohydrate; 0 Vegetable; 4 1/2 Lean Meat; 1 Fat. Carbohydrate Choices: 1. This entry was posted on 6:19 AM and is filed under Pork . You can follow any responses to this entry through the RSS 2.0 feed. You can leave a response, or trackback from your own site.